Has there ever been a sweeter face than this? 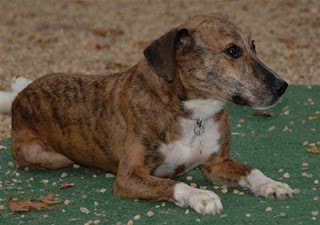 Reese (as in Reese's Peanut butter cup) is in need of a loving lifetime home. She was heartlessly abandoned as a pup and spent several days tied to a lamp post before someone rescued her. She just lost her second home due to her family going through a divorce. She is a sweet and sensitive dog who is understandably a bit scared to find herself at the shelter and we are hoping a good home comes along soon.